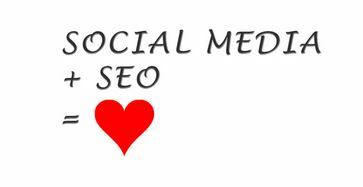 Does Social Media Help Search Engine Optimization (SEO)? Companies are no doubt at least familiar with the concept of social media. The problem is that being aware of the importance of social media marketing for your company is one thing. It’s another matter entirely to understand every facet of social media marketing as it pertains to your specific company or brand. This is particularly true when it comes to understanding why and how social media helps your Google (and other search engine) rankings. Social media isn’t going anywhere anytime soon. If anything it’s going to become even more integral to the success or failure of a company. This is why you need a social media company. You might have a Facebook page or Twitter page for your business. You might even have both, with a little bit of Linkedin. The question you need to ask yourself is if you’re truly using social media for your business to its fullest potential. The answer to this question is likely no, but there is something you can do about it. A social media company can help you to realize the benefits of exploring every possibility that social media marketing can present to you. And trust us there are tons of amazing niche avenues to target your online marketing efforts. It’s also smart to familiarize yourself with the benefits of social media as it pertains to search engine optimization. In fact there are industry rumours that excellent content that is well shared will start (if not already) to effect how well your website ranks on Google. It kind of makes sense, right? Google wants to deliver good content to users. If Google can see two articles about (for example) a social media company. It’s going to rank the page that has already been “liked, “pinned” or “tweeted”. The USERS are now telling Google which is the best content for that search term. SEO is so effective because it analyzes every aspect of your business, every aspect of your marketplace, and every aspect of what people are searching for and talking about in relation to your business and marketplace. It combines all of these things to give your company an accurate idea of what needs to be done to take full advantage of your online marketing opportunities. One of the biggest benefits of SEO is that it’s a constant process. Marwick Marketing is a leader in SEO because we understand that effective search engine optimization is an ongoing process, part of your marketing plan, not a fly by night quick fix. It needs to be constantly updated to be truly effective. Social media is also something that is constantly evolving. The impact of social media on virtually every facet of our lives is profound. Sites like YouTube, Facebook, Pinterest, Tumblr, Google+, and others are being used by billions of people around the world at every hour of the day. This is something that is even influencing how people use search engines, and what people find when they use search engines. It’s true that social media is only a part of an effective SEO campaign, but it’s definitely an important part of a SEO marketing. ← Is it time to evaluate your marketing?